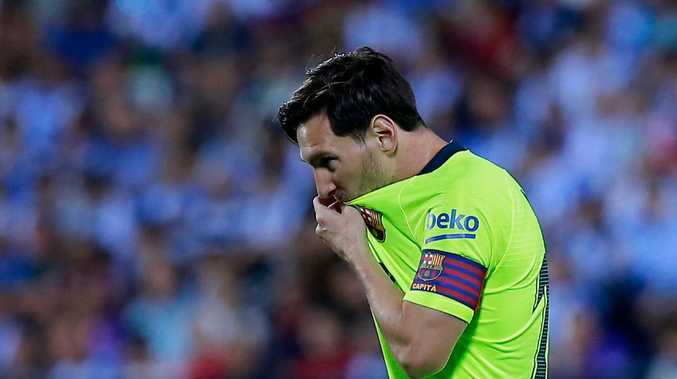 ERNESTO Valverde defended resting key players after Barcelona's shock 2-1 defeat to Leganes on Wednesday but admitted his team have fallen into in a "very difficult moment". Gerard Pique committed the decisive error, his fluffed clearance allowing Oscar Rodriguez to score Leganes' second goal in two incredible minutes, and the winner at Estadio Municipal de Butarque. Nabil El Zhar had nodded in an equaliser just 68 seconds before and by the end Philippe Coutinho's sumptuous early volley was reduced to little more than a footnote. After drawing at home to Girona on Sunday, albeit with 10 men, Valverde's selection came under scrutiny, after he opted to rotate for the second time in three days. Against Girona, it was Coutinho, Ivan Rakitic and Samuel Umtiti on the bench and just as they all had to be called upon in the second half at the Camp Nou, so were Luis Suarez and Jordi Alba as substitutes here. "Of course the coach is responsible, a losing coach always feels responsible," Valverde said. "But obviously it is easy now to talk about the rotations -- in the end, matches are analysed on results -- but you can't win the league with only eleven players." Barcelona face Athletic Bilbao on Saturday and then Tottenham at Wembley in the Champions League four days later but one point from two of La Liga's lesser opponents is a concern. So is the form of Pique, who was also at fault against Girona last weekend and will have to start against Spurs, with Umtiti suspended. "You have to judge the whole team, not individuals," Sergio Busquets said. "There are no excuses. We have to concede fewer goals and be more solid. Today the league isn't lost but we might miss these three points at the end of the season." "The other day the point was different," he said, referring to the draw against Girona." "Today we have no excuse because we played 11 against 11. We should have been solid but we have given chances away and it has cost us a lot. "I am worried about conceding goals." Things began well enough. Lionel Messi darted one way and then the other, before passing left to Coutinho. His touch sent the ball spinning into the air but the Brazilian adjusted, cutting his right foot across the ball and sending a brilliant volley into the bottom corner. Messi hit the crossbar soon after with a curling effort and a second seemed a matter of when rather than if. Instead, Leganes found a foothold and Youssef En-Nesyri should have equalised, only to head straight at Marc-Andre ter Stegen. Then from the 52nd minute, they scored not one, but two. First, Barca were ripped open on the break as Thomas Vermaelen failed to stop El Zhar heading in at the back post. Barca kicked off, Coutinho conceded possession and one long ball forward caused chaos again. Pique attempted to clear the cross but, off balance, succeeded only in slicing it to Oscar, who slammed it into the net. Seven minutes later, Suarez was on and then Alba and Malcom too, but it took until the 80th minute for Barca to go close. It was to no avail as Leganes goalkeeper Pichu Cuella palmed away Coutinho's shot before jumping up to tip over the rebound from Rakitic.